Eljanov on Ukrainian players wanting to abandon their federation and Shirov’s unusual training methods, Gashimov on “incorrect” Chinese chess, and more: the Azerbaijan site was on hand to report a lot of interesting material from the World Cup in Khanty-Mansiysk. “The majority of strong Ukrainian chess players want to change federation” (as there’s no money or support – perhaps not even enough to send teams to international competitions). “I think there should be one normal person in a marriage” (on persuading his wife to give up professional chess). “It’s hard to say. 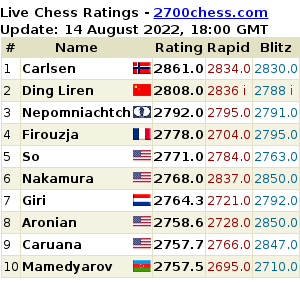 Perhaps Shirov [will win the tournament], he’s in a very serious mood. He arrived with a second, a girl. Clearly he prepared vigorously”! Laznicka in his press conference after the second game with Mamedyarov simply said that if a player as strong as Mamedyarov wants to draw with white he will – but it seems as though no-one challenged him about agreeing to a draw so soon. Kamsky said he’ll keep playing chess until he’s 40 (he’s 35 now). He also mentioned he still had the same off-the-board distractions as during the Topalov match, though he didn’t specify what they were. He’s not especially happy with the US chess federation, but won’t switch.